With over 30 million sufferers of chronic travel sickness in Europe alone, Citroën claims its brand new SEETROËN glasses are the first to eliminate the condition. The SEETROËN glasses contain a coloured liquid that recreates the horizon line to resolve conflict between the senses – providing a solution for the ailment (also known as Kinetosis) that affects so many people, with as many as one in three experiencing travel sickness symptoms at least once in their life, says Citroën. Initially developed for sailors, Citroën has adapted the technology so that it can be used on any means of transport. 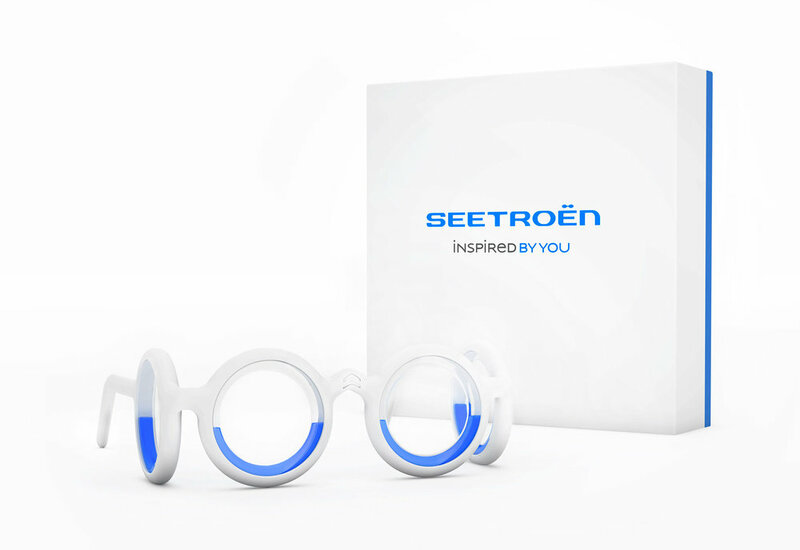 SEETROËN glasses were developed by Boarding Ring, a start-up company based in Var in the south of France. The Boarding Ring technology is a patented and tested paramedical solution that has an effectiveness rating of 95%. The rings that surround the eyes both along the frontal axis (right / left) and sagittal axis (front / back), feature a coloured moving liquid which simulates the horizon and resolves the conflict between the senses that causes the sickness. The white soft-touch plastic glasses were designed by 5.5, a collective design studio based in Paris, to reflect Citroën’s fresh, simple and ergonomic style. As soon as initial symptoms of motion sickness are experienced, the glasses should be worn. After 10 to 12 minutes, the glasses will allow the mind to resynchronise with the movement perceived by the inner ear while the eyes are focused on an immobile object such as a smartphone or a book. The glasses can then be removed for the remainder of the journey. The glasses can only be used by adults and children aged ten or over, as this is when the inner ear has finished growing. They have no lenses so they can be shared with travelling companions and may also be worn over prescription glasses. SEETROËN glasses are available to order from the UK on the Citroën Lifestyle Boutique at a price of €99.